I'm thinking about mounting an unnecessary amount of auxiliary lights on my Durango. I've upgraded all of the existing lights to LED, literally every bulb inside and out, but it's just not enough for driving at night on the back roads. I was thinking of adding a 50" or a 52" (I've done 0 measuring) above the windshield, but can't seem to find those mounting brackets for a durango. Has anyone tried the ram 1500 mounting brackets, or know of any for a 2nd gen D? Also, any suggestions on light bars behind the grill? I'm talking size, where to mount, all of it. 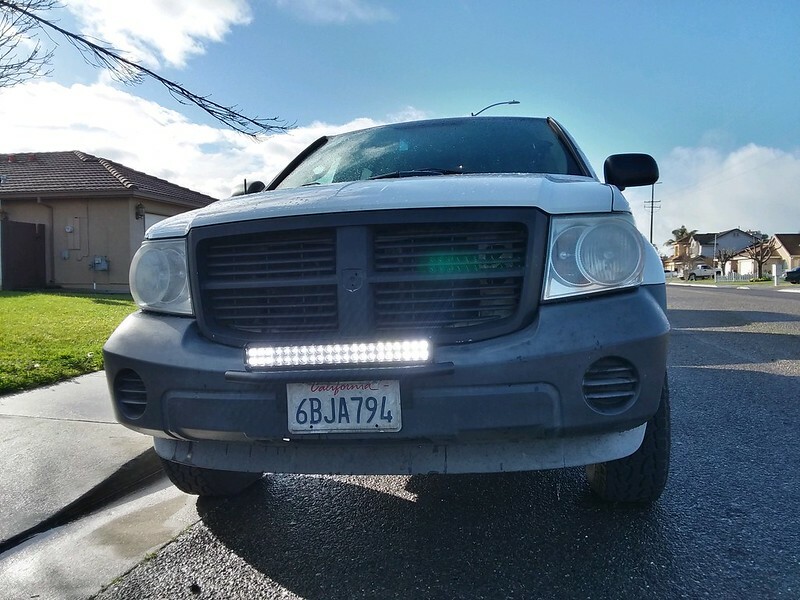 I've never put additional lighting on any vehicle, but this durango just seems made for offroad lighting. If you want a really easy solution to aux lighting, you can buy this $50 kit. Might not be your style, but no modifications had to be done in order to install this. Just bolt on, wire up, and run the switch into the cab, done. On a side note. Did you replace your headlight bulbs with LED's? If so, what did you go with? Did you have to get cancellers? Anybody with a Bull Bar/Push Bar on a 2014? Brush Guard, Bull Bar, Light Bar? What are the options for these 1st Gens?